IMMEDIATELY AFTER PAYMENT, YOU RECEIVE THE XBOX LIVE GOLD ACTION KEY 14 DAYS. * You will receive in your personal account http://www.oplata.info. Also, a link to the page with the key will come to your e-mail specified at purchaseAttention! Attention! The trial version of the Golden Status of Xbox Live Gold provides temporary access to the capabilities of Xbox Live, including multiplayer games on the network. 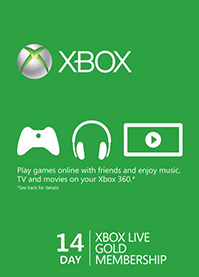 With this card, you can create a new account in the Xbox LIVE service for 14 days, which previously did not activate Gold status. Attention! This is a Live Gameplay Status card, you get almost the possibility that Gold status (you can not download games and go to websites from your console, such as youtube.com, google.com and others). But you can play on the network with other players. You can not play World of Tanks Console. 1) On the Xbox Live welcome page, click "Continue". 2) Enter the NEW gamertag (nickname) that you did not use before. 3) The next step is to enter the Windows Live ID. Click "NO" to create a new account. 5) Select the language and the date of birth. 6) Enter the new email address you did not previously use to create the Windows Live ID. 7) Enter the password and the security question. 8) Then enter the first name, last name, phone number and contact email. 10) Click "Redeem code" and enter the purchased 25-digit code. • Enter the code you purchased. export. Все прекрасно,быстро и недорого. Всем советую! !